Sup guys! Can't believe it's spring already, this year is just flying so fast! I'm more than ready for the warmer months coming up ahead though. 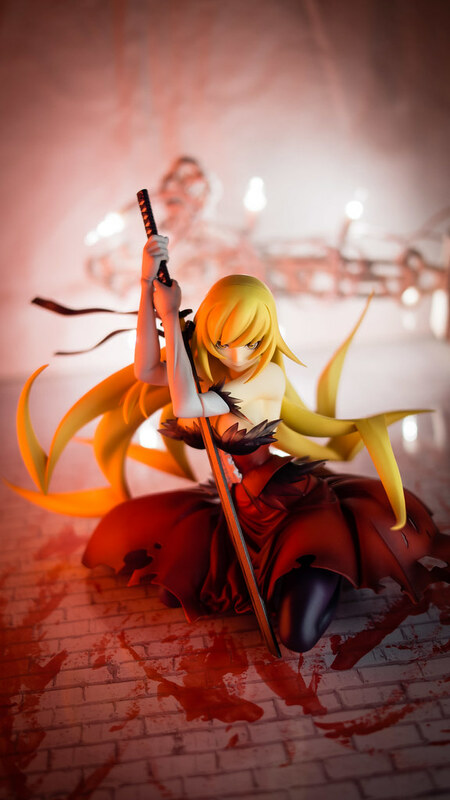 One of the things I was looking forward to this spring was the screening of the first part of the Kizumonogatari film from the good folks at Shaft. 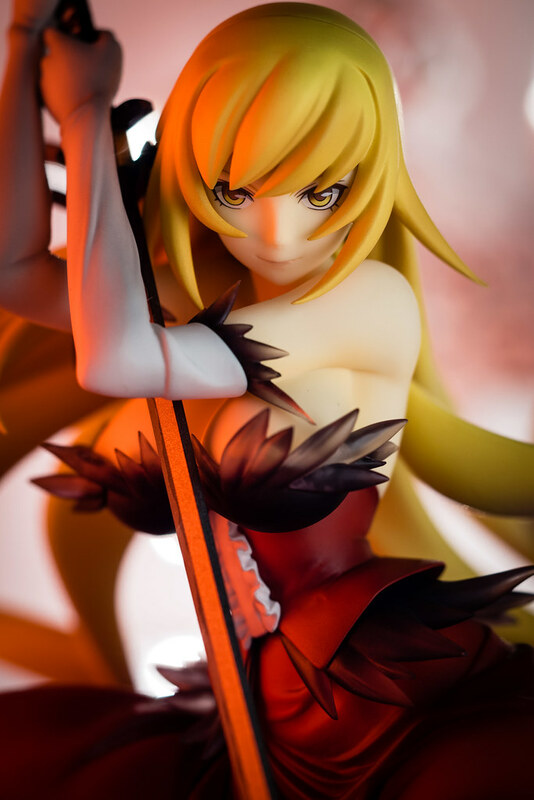 The main reason I was anxiously awaiting was to see the super cool Kiss-shot Acerola-orion Heart-under-blade. While she was on for a criminally short amount of time on screen Good Smile Company has provided me with an easier way to admire her. That said though as short as it might have been the scene where she was featured more prominently is probably the best scene from the film in my opinion. It had such a strong impression in fact that I just threw away my plans for this figure and started anew. While I pictured a dark, foreboding, tense atmosphere the movie went a bit in opposite direction. It sure was tense and foreboding but the imagery was actually quite bright and bloody. It was quite lucky for me that the movie was able to inspire this reaction. 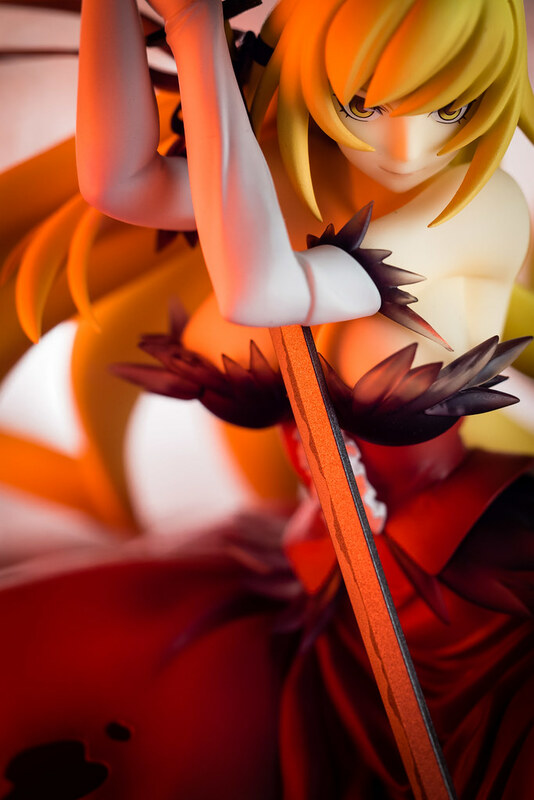 I had actually already attempted to take photos before of this figure but I was very unsatisfied with the results. 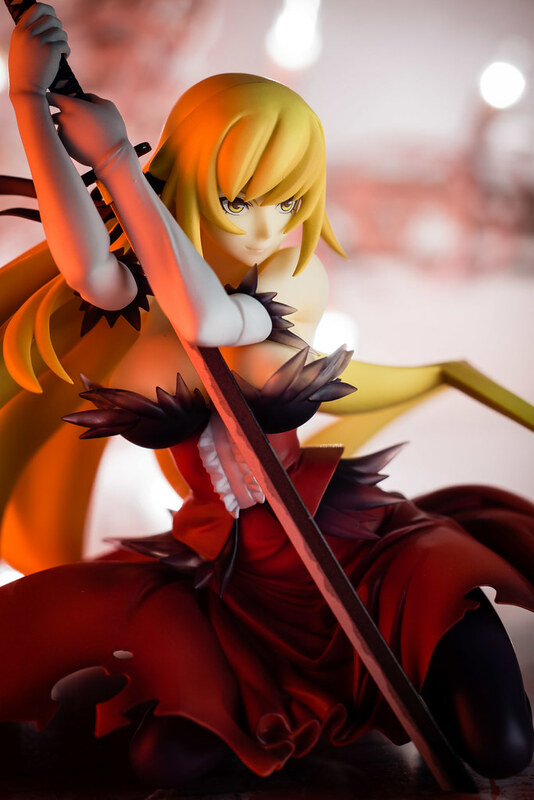 Now though I had the needed motivation and ideas to re-shoot Kiss-shot. Aside from the nice dose of inspiration from Kizumonogatari it was great to finally be able to watch Araragi's and Shinobu's origin story. From the very first episode of Bakemonogatari we had been shown small glimpses and allusions to it all the way to the latest Owarimonogatari. It's one of those things that I just kept wanting to see more and more as new tidbits were revealed. Quite recently I got a chance to do so with the English release of the novel and with it another thing I have been wanting to experience read one of the original novels. Ultimately I ended up not doing so, I wanted to experience the movie for the first time with no bias from the novel. The same way I had experiencing the franchise up until now. Once I watch the second part I will do so and experience this series it its more literary form. Sometime in the latter half of the year anyways. As just as Shaft teased with the last line of the movie we will have to wait for the rest of the good stuff until then. Sadly I will looking forward to doing so a bit less than for the first part. While I really enjoyed watching Kizumonogatari on the big screen I can't say the same about watching it with a large group of people. Perhaps it's all because I'm used to watching shows while relaxing at home quietly enjoying my time. Perhaps the crowd reactions distracted me. Perhaps it was because the guy next to me had a loud obnoxious laugh, would laugh at every little thing and would slap his leg while doing so disturbing me greatly in the crowded theater. Yeah, it was definitively that guy. Overall it was still a reasonably good first experience for this kind of thing and glad I finally experienced it. I have had terrible luck when it comes to anime showings on the big screen. A surprising amount of them are during weekdays making it hard for me to attend during the work week or as with the Love Live! movie, I end up traveling out of town or with a prior commitment. The figure on the other hand though it has been definitely a 100% positive experience. 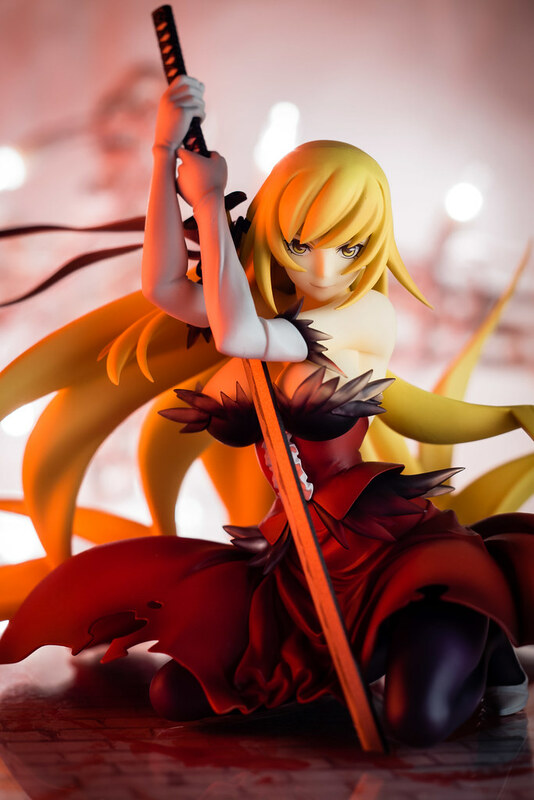 While I love Shinobu to bits, I always longed for seeing more of Kiss-shot when I watched the show. 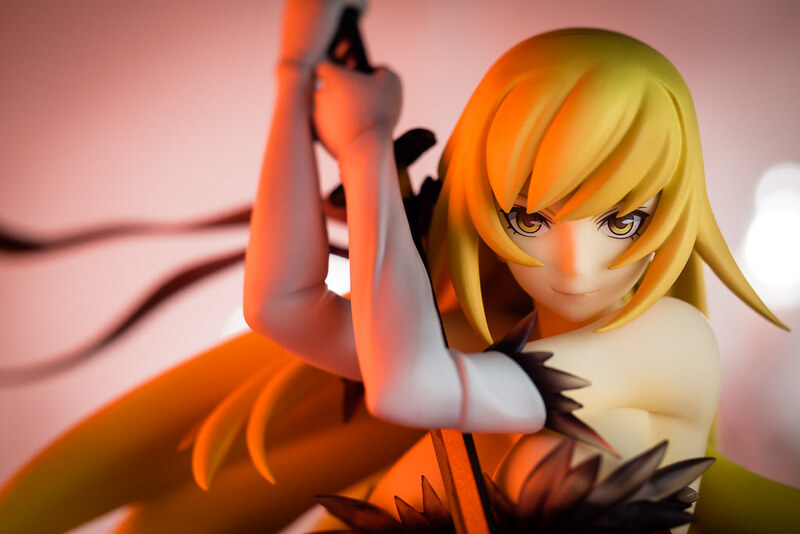 Her brief appearances such as in Kabukimonogatari only serve to exacerbate that feeling. Quite conveniently for me Good Smile Company has once again gone ahead and delivered quite nicely a high quality figure that looks pretty much perfect. 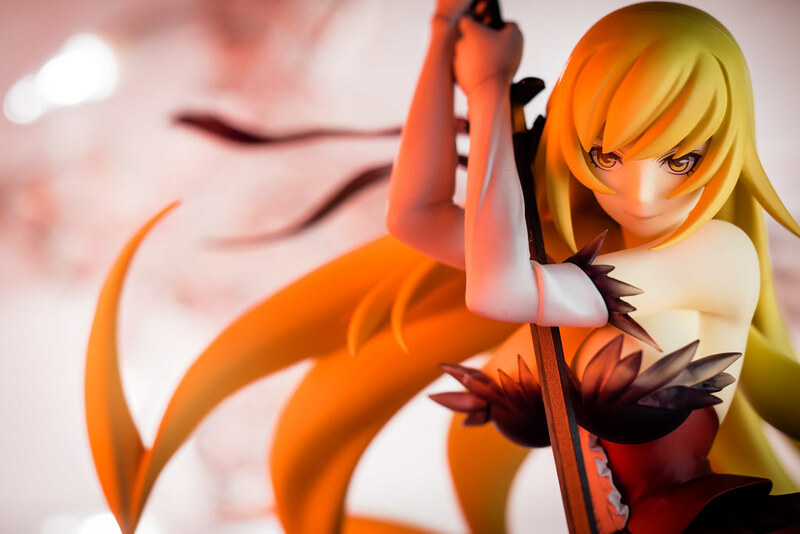 My favorite aspect is definitely Kiss-shot's smile. I can just feel the overwhelming confidence, the somewhat arrogant demeanor, the exuberance of power. I own plenty figures of pretty smiling girls but this somehow I get a totally different vibe in this situation. 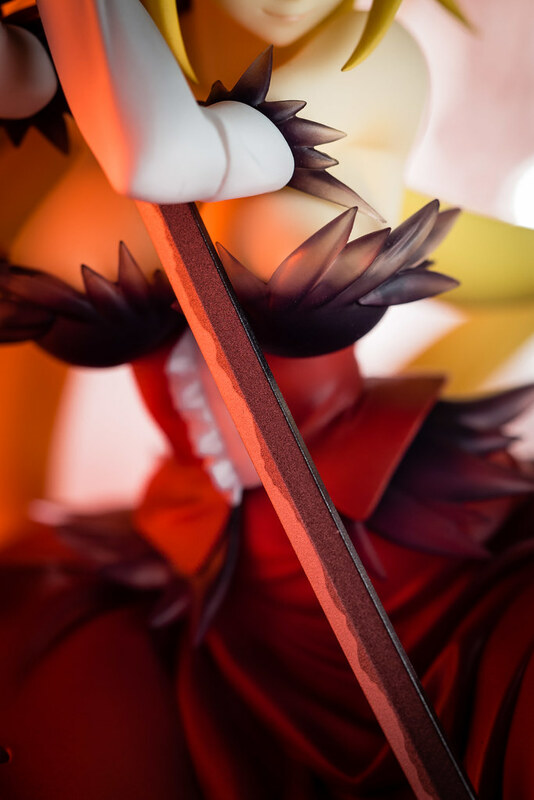 GSC's attention to detail can be easily appreciated around the figure. 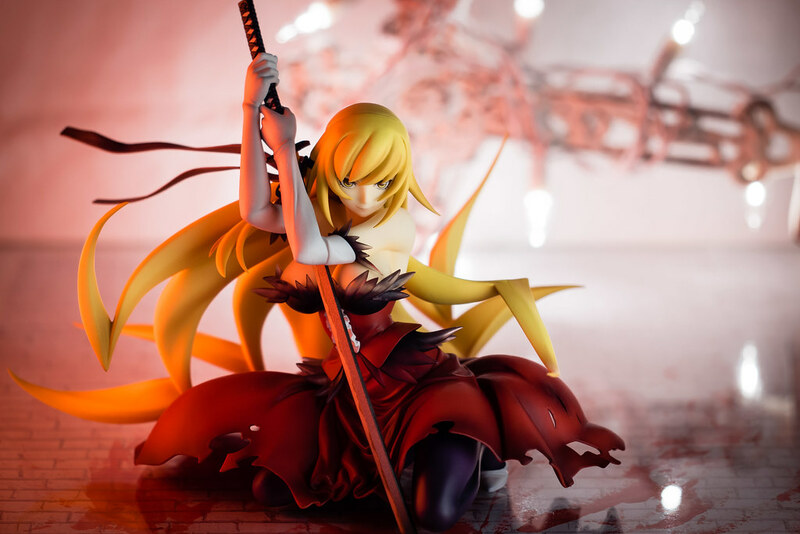 Kiss-shot's dress contains many tears and singed marks adding to the illusion of the skirt's texture. The folds of the skirt, the attention to the shape of the cloth as it drapes over the legs serve to continue to adding to the illusion of realism. Kokorowatari looks the part quite nicely, the paint work gives the exquisite texture and look of a Japanese sword. Several parts such as the tempered line, the ridge and edge of the sword are easily visible given it good sense of authenticity. 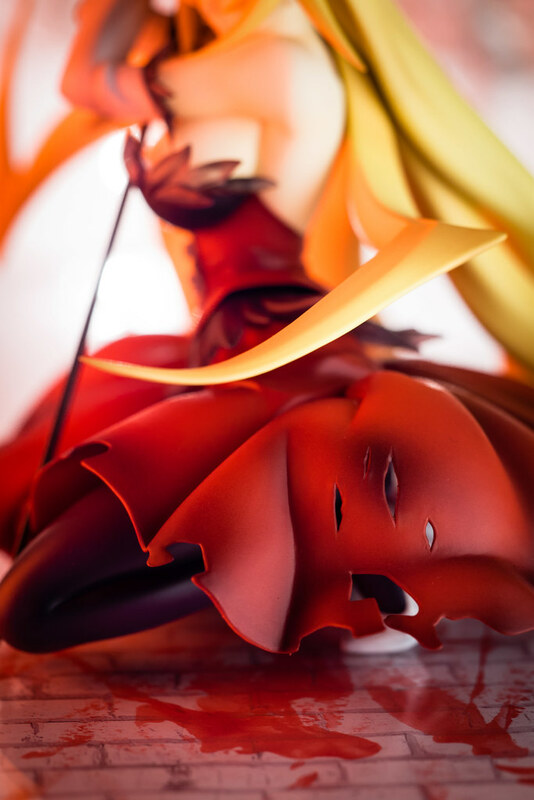 The feathery accents on Kiss-shot's dress with their translucency provide a delicate image and serve their role. 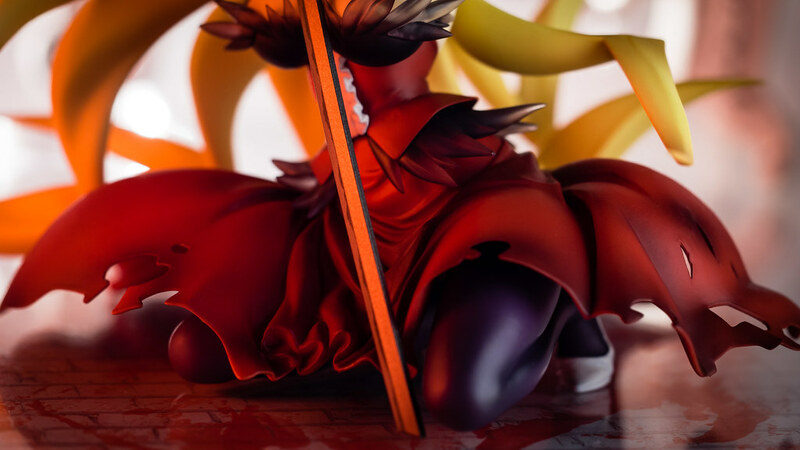 The skirt can be cast off giving easy access to take a gander at Kiss-shot shapely long legs, he nice plump thighs and backside. I find however that without the skirt the figure feels a bit unbalanced by the lack of volume when compared to the top part. 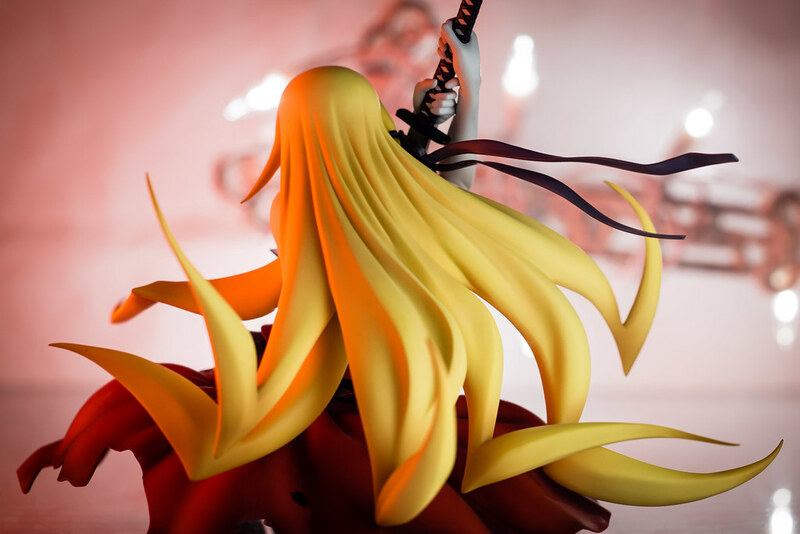 The reason for that being Kiss-shot's long voluminous hair given its pretty appearance with all the nicely sculpted strands and expertly done shading. The illusion of motion once again done well with the direction of motion easily garnered at a glance. If there is one complaint it definitely has to be the long wait for this figure, when most of the time figure releases are measured in months seeing one such as this measured in years is quite unusual. 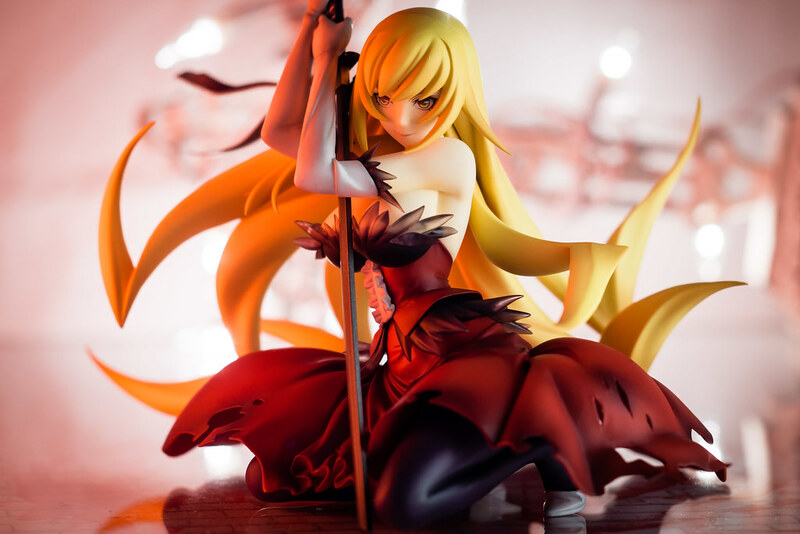 Seeing as Kiss-shot was released pretty much simultaneously with Kizumonogatari it makes me wonder if that had anything to do with the timing. Did GSC simply take so long to release because Shaft took forever and a day to release the movie? For me, the wait wasn't particularly long or annoying aside from the always expected one or two month delay. 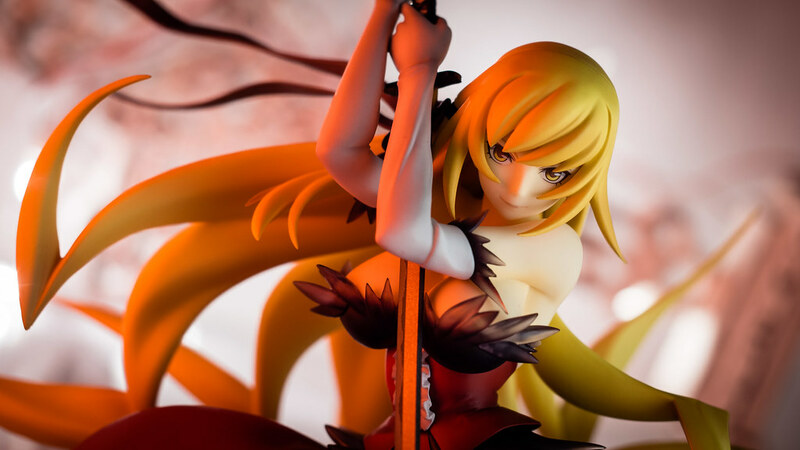 I jumped quite late into the Monogatari bandwagon, right around the time Nekomogatari was being released. Was the wait worth it? I would say yes. I have no complaints at all about the figure itself, whether it is the sculpture or the paint work. 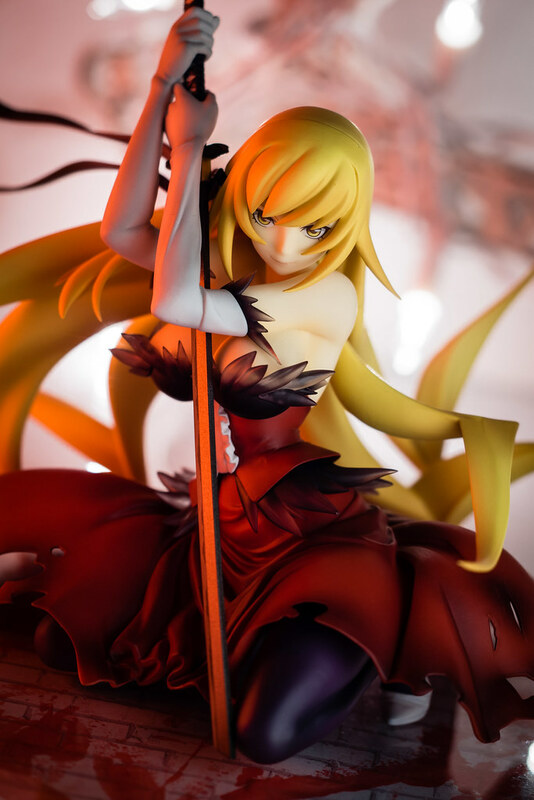 Plus, if anyone ever wanted a nice figure of an adult Shinobu or were tired of all the donuts this is definitely for them. 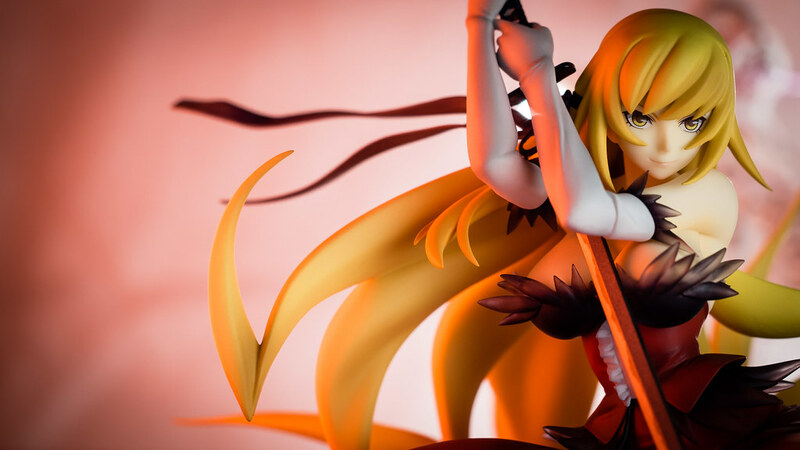 Now then, I wonder how many loli Shinobu figures I have to go through before someone makes a nice scaled released of teenage Shinobu that is not a prize figure.